The classic Balans® that started a sitting revolution. In 1979 Varier launched a sitting revolution that spread throughout Europe and the USA, the groundbreaking Variable™ Balans®. 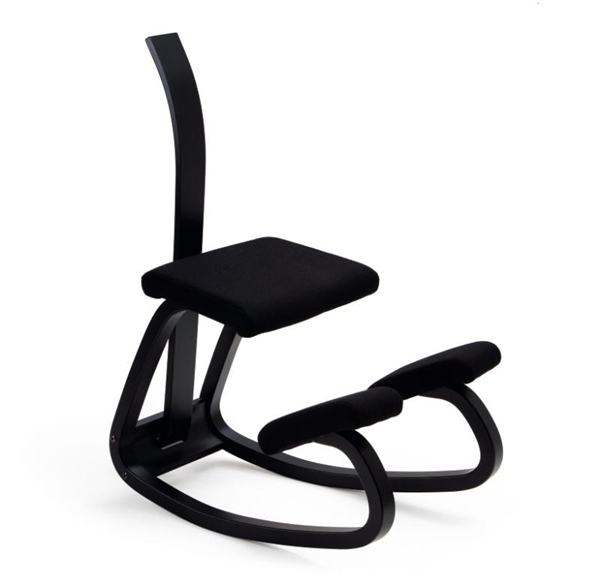 The chair reflected the playful spirit of the 1970’s with simple, dynamic, and ergonomic design. The chair is still very popular today. 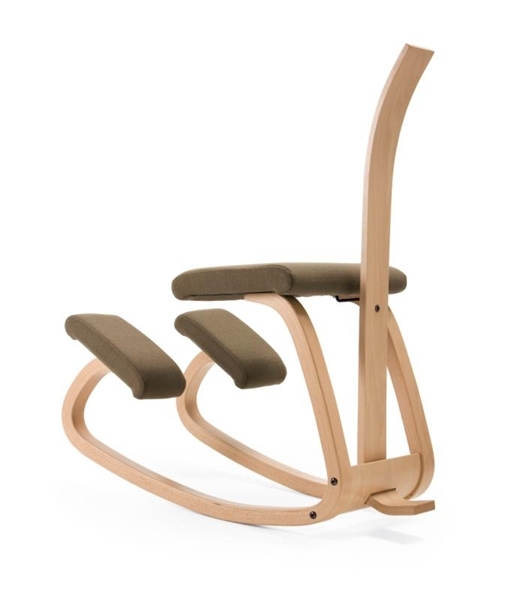 The Variable Balans encourages movement and supports the body through each movement made. Body and chair, action and reaction, in a cycle of continuous motion that energizes and enlivens the body and mind and helps you focus. 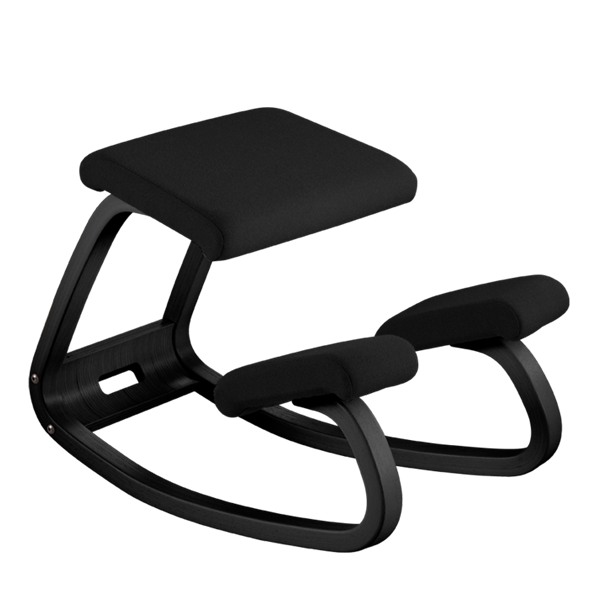 Considered "the Original Kneeling chair", the Variable Balans chair has become the benchmark for all kneeling chair designs. 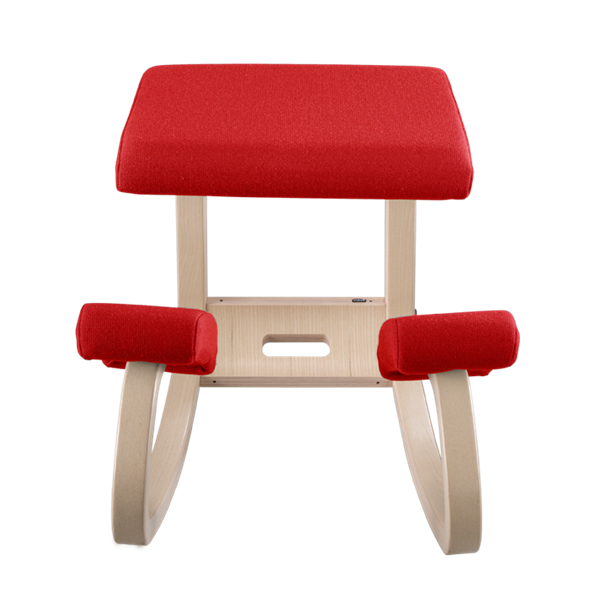 Forward-sloped seats on a curved wooden rocker base support the body in a seated, kneeling position. 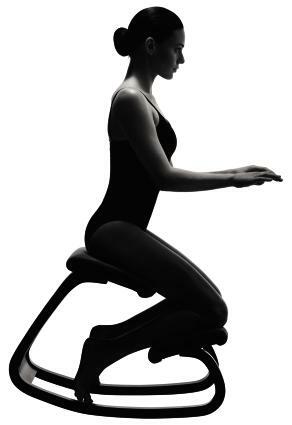 This allows the angle between the thighs and torso to increase, allowing the body to naturally adopt an upright posture, relieving spinal pressures and facilitating deeper breathing. Kneepads secure your body on the sloped seat and rest your feet toward the back. 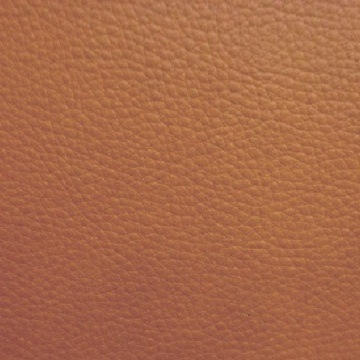 Polyurethane foam cushions the seat and kneepads. Ash wood frame is strong and durable. Wood is harvested from sustainably farmed sources. We’ve had a Variable balans chair since ‘87 or ‘88. My father, a college professor, would sit and think and work. He gave the balans to me 6 or 8 years ago. Who would’ve thought that an old, used chair would become one of my most prized possessions, so greatly valued out of pure necessity? Now I am my father’s age at the time he bought the chair and – having endured a lengthy recovery from a bilateral laminectomy back operation three years ago (L4 + L5) – I’m glad to be sitting on it now. And, like my father, I’ve found that the balans is the only chair I’m comfortable in for any length of time (say, anything longer than 5 or 10 minutes! ); it helped me return to work through terrible back pain. We’ve reupholstered the chair twice; not bad in all these years! 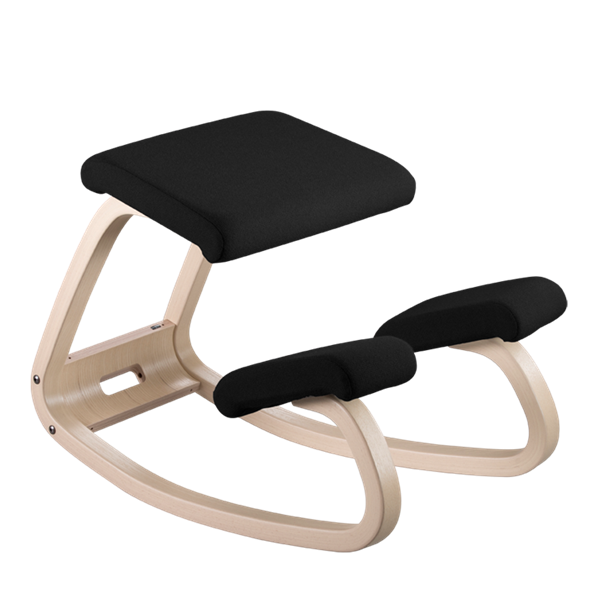 Sadly, the chair was cracked during a move when a refrigerator fell into it, so I’m very careful to move just so . . . . Today is a very special day because I am ordering a new Variable balans chair. You can’t change perfection. on 10/25/2013 The most comfortable chair I have EVER sat in! 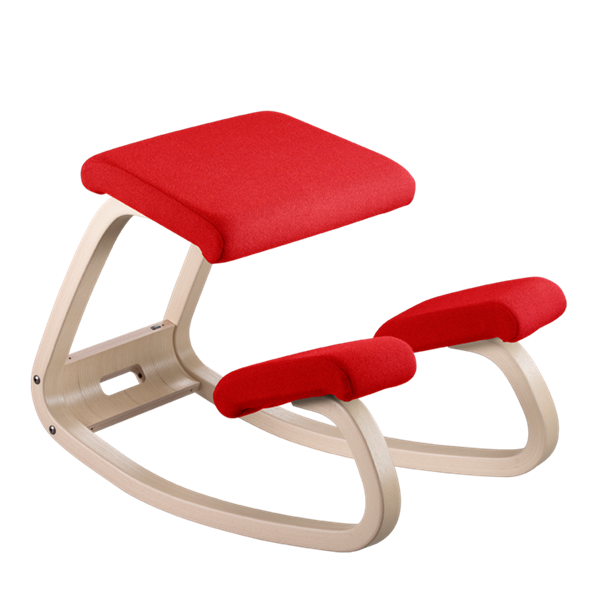 When I first saw and tried a Variable Balans chair in a store, it was in the mid-1970's. Altho' I've always wanted to own one, it wasn't until recently that I received a Balans chair as a gift. From the first minute it has been the most comfortable chair I have EVER sat in. My job as an operating room nurse requires a lot of standing, or running around [depends on the assignment of the day]; so, when I sit at home, I really need my poor aching back to be as comfortable as it can be. And, using the Variable Balans chair at my computer is perfect. Thank you, thank you for keeping the basic design for the last 30 years!! 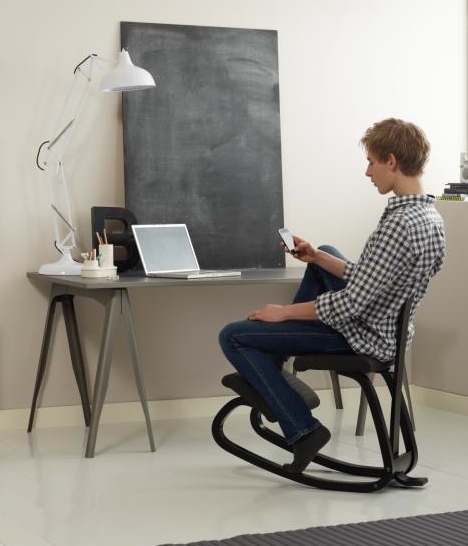 My question is: would you be able to design a similar chair for commuting? " One negative is that it doesn't have wheels underneath so it doesn't spin and it's not good for rolling around or fumbling through the office drawers around your desk. But it does rock, which is a health benefit, so it's a trade off. 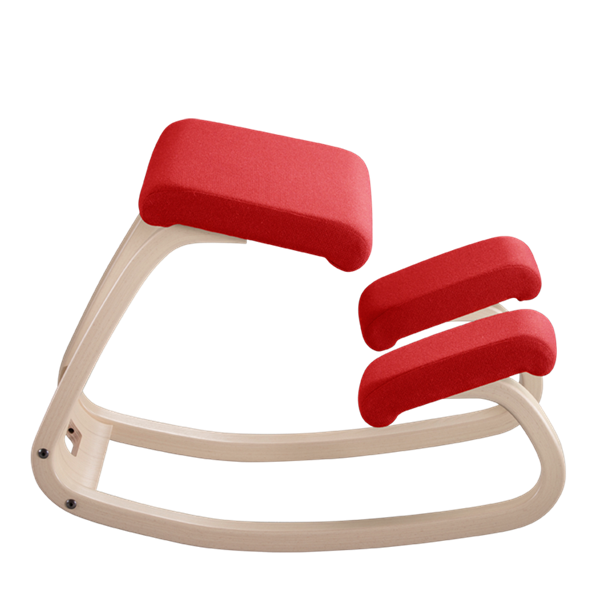 Fits both children and small adults over 4'3" with the optional extension blocks accessory that reduce the distance between the kneepads and the seat. 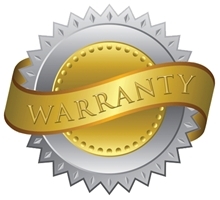 We do not recommend the Variable Balance for those over 5'9", those with very long legs, or those with big feet. For these individuals there may not be enough room for the legs, forcing the knees to bend further than is comfortable.